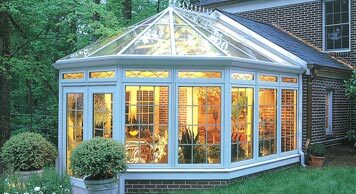 Designed for year-round living, our sunrooms and room additions can be customized to fit your lifestyle while enhancing the beauty and value of your home. 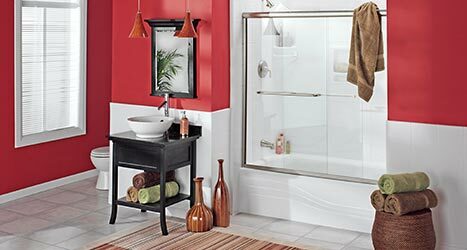 Our bathroom transformations enhance the style and functionality of any space, and with an extensive list of products and services to choose from. Room additions are a fun and unique way to increase the visual appearance, functionality, and value of your home and add that much needed space. A Four Seasons Patio Cover provides elegant protection from the blazing sun and light rains so you can enjoy your patio when others are driven inside. 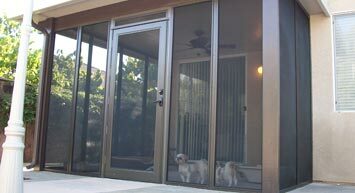 If your pets have clawed or scratched your screens, pet proof screens are the perfect solution. Our pet proof screens will resist tears and punctures from clawing and scratching by household pets. 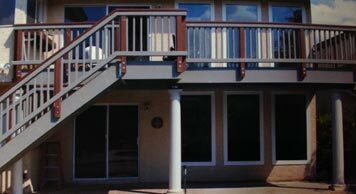 Choosing a Sunboss Deck or Railing gives your deck that WOW factor. By choosing the best design for your deck, you can make a huge difference in its appearance. View Your New Room Addition Before It’s Built. Sun Boss Corporation is the oldest patio construction company in Southern California. John Kain founded the company and started the company based on building a better product to provide solar protection to the exterior of local homes here in Southern California. 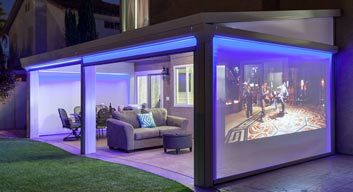 Over the past six decades, Sun Boss has been developing solar protective products that ultimately provide a great deal of shade, protection and unique outdoor and indoor living areas. Products that often qualify for federal tax credits by making your home a more efficient and comfortable place to live. From the most basic solar powered attic ventilation system, to the most extravagant third story home addition built to bring in the sunset views, yet allow year round comfortable living. Sun Boss has worked vigorously to make your home the most efficient and comfortable home it can be. Sun Boss provides full service contracting from original design, planning, engineering to final completion of your home addition. We have a full staff of professionals to assist in all aspects of planning your dream project. Our staff is educated and experienced in all phases, including; designing your project, planning, financing, engineering, all the way through permitting and on to final construction. Sun Boss will provide you the most attractive, functional room in your home. We create the feeling of living outdoors… indoors all FOUR SEASONS! Sun Boss boasts over 75,000 satisfied customers since 1947. We pride ourselves in helping you add a beautiful living space that not only increases property value, but will return your investment time and time again. Sun Boss offers the highest quality products in the industry. Since David Kain took control of the day to day operations at Sun Boss the Kains have managed to stay true to their original goals. It is important to remember when selecting a contractor to handle your project, that you want someone that will do what they say, when they say it, and at the agreed upon price. You want to be sure the contractor of choice has a flawless record with the Contractors State License Board (www.cslb.ca.gov). You also want to be sure you are dealing with a contractor that specializes in patio construction and or remodeling. Sun Boss Corporation holds a B-1 license. Our State License number is B-1 D03 310674. 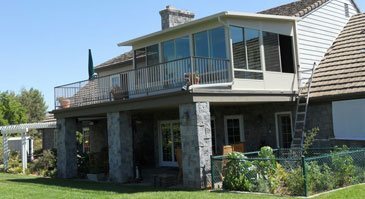 The B-1 portion covers the general construction side of our business, sunroom additions, and second story decks. Sun Boss Corporation is affiliated with the Better Business Bureau (bbb.com), as well as the League of California Homeowners (www.homeowners.org). We participate in these consumer protection agencies to provide our clients peace of mind that their project will be completed as agreed upon, on time and on budget. These agencies are in the business of critiquing and evaluating the management of local businesses, please review their sites to understand the screening we have gone through for you, to give you the comfort of hiring us to be your contractor of choice. From the most basic installation of a solar powered attic ventilation system (typical install 2 hours) to a complete rebuild of your second and third floor, Sun Boss has you totally covered and protected with all the proper certifications and insurances. Your peace of mind is our JOB! There is no Viba Portfolio test1 style. Please create the style first.